Frigid cold temperatures couldn’t stop more than one hundred community members from attending the 23rd Annual Martin Luther King, Jr. Day Ceremony at The Ridgefield Playhouse this afternoon. For more than two decades, Ridgefielders have gathered on Martin Luther King, Jr. Day, to celebrate and honor the courageous civil rights leader. 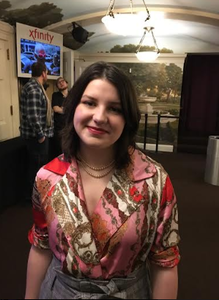 The MLK Profile in Courage Award -- a new award -- was presented for the very first time at the ceremony to Ridgefield High School student Lane Murdock who helped launch a national movement. This past year, following the school shooting in Parkland, Florida on Feb. 14, Murdock, then only 15 years old, started a petition to the U.S. Senate and launched a nationwide school walkout. The date she chose for the march was Friday, April 20 -- the 19th anniversary of the shooting at Columbine High School in Colorado. For Lane, it was important that students have a voice and not feel helpless in the wake of such a horrible catastrophe…..again. Today, Murdock gave an empowering speech about the power of one voice and how it can bring about change. Westport actress, singer and poet Kimberly Wilson recited a rendition of Dr. King’s “I Have A Dream Speech”. 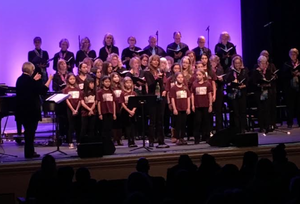 The MLK Ceremony came to life by way of song thanks to The Ridgefield Chorale accompanied by Cantor Deborah Gray and ACT of Connecticut young performers. Thanks to Ridgefield resident Mark Robinson, the powerhouse behind this important community celebration.